Not only do elephants use branches to swat flies and scratch their backs, but they also use tools to plan for the future. In South Africa, biologist Hezy Shoshani observed a pachyderm chewing bark into a large ball and then using the ball to plug up a nearby watering hole. The result was an elephant-size water bottle! Later, the animal came back to the spot, removed the ball, and quenched his thirst again. In addition to bouncing balls on their noses, dolphins are also handy with sponges. Georgetown University researcher Janet Mann reported that bottlenose dolphins in Australia's Shark Bay have been seen carrying sea sponges in their mouths while fishing along the ocean floor. When they dig into the sand to stir up hidden fish, the sponges apparently act as a kind of mask. But, of the thousands of bottlenose dolphins identified in Shark Bay, only 41 have been observed doing this. Almost all of them were female, and the behavior seems to be something mothers teach their daughters. New Caledonian crows are widely renowned as the tool-using champs of the bird kingdom. To hunt for insects, they shape sticks into hooks and spears that allow them to probe tree crevices. They also modify those sticks into the correct size and shape by whittling them with a complex process of snips and tears. What's more, New Caledonian crows can make new tools out of old ones and pass along their new inventions to others. "¨The only other creatures on Earth known to do this are humans. Some burrowing owls have a strange habit of scattering cow manure around the entrances to their homes in the ground. Until recently, scientists thought this behavior evolved as a way to mask the owls' scent from potential predators. But researchers have determined that the cow manure actually functions as bait to lure dung beetles, one of the owls' favorite foods. Egyptian vultures love the taste of ostrich eggs, but they can't break the thick shells by just pecking at them. So hungry vultures go in search of rocks for the job, sometimes venturing up to 50 yards away. When they return, they dip their heads violently and hurl their rock at the egg, smashing open the shell. Surprisingly, this technique appears to be an innate behavior. When presented with tasty eggs, even vultures raised alone in captivity will go hunting for stones. Chimpanzees of the Ivory Coast's Tai Forest are the Bob Vilas of their species. In order to crack open the hard oil-palm nuts they adore, the chimps use two tools at once. First, they place a nut on a flat stone for traction, then they smash it with a pointed hammer-like stone. The skill takes young chimps several years to master, but once they get the hang of it, they'll store their favorite tool sets in certain places and bring their nuts there for cracking. A recent archaeological dig found that Tai Forest chimps have been making nutcrackers like these for 4,000 years. Like Jane Goodall's chimpanzees, wild green-backed herons "fish" for their food. Using insects, feathers, or even flowers, they drop their clever bait into the water and then gobble up the curious fish that come to the surface for a meal. Herons can be remarkably persistent fishermen, too. 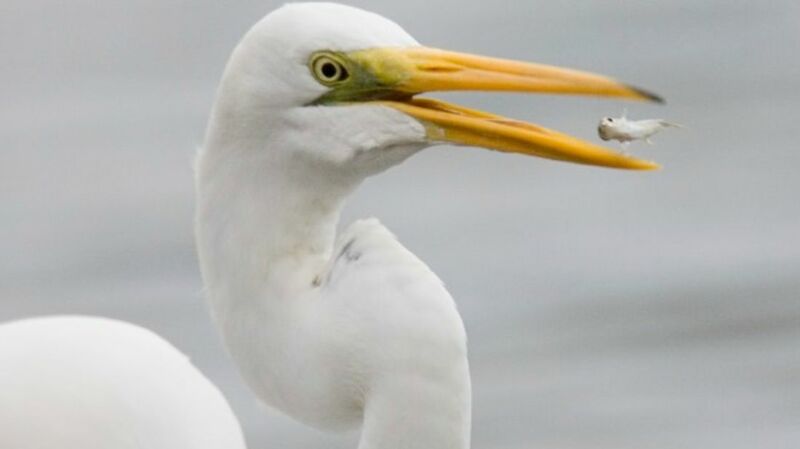 Reportedly, one researcher in Africa watched a heron drop the same bait into the water 28 times in a row before a fish finally bit.